You choose an intellectual property boutique firm because you need attorneys that understand what your business is about. You expect your attorneys to give you legal advice that is mindful of your business objective. Our attorneys have extensive transactional experience. We have guided clients in financing rounds, merger, acquisitions, asset transfers, licensing deals, strategic alliances, and more. Several of our attorneys hold MBA degrees and many have substantial business and management experience from prior careers. You choose a boutique firm because you have a specific need. You expect the firm to pay attention to you. Christopher & Weisberg strives with every client to provide personalized service that is responsive to your needs and situation—the type of personalized service that is focused upon contributing to your legal, technical and business goals. 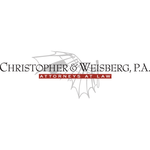 The attorneys at Christopher & Weinberg are knowledgeable, thorough, responsive and professional. Review Stream Powered by OMG National | © Copyright 2019. Christopher & Weisberg, P.A.. All Rights Reserved.